Cryptopsy, one of the most iconic extreme death metal bands to ever exist, play their inaugural NZ show this August. Albums like ‘Blasphemy Made Flesh’ and ‘None So Vile’ laid down the benchmark of technical death metal in the mid 90’s and are still go-to albums to this day. Even as more progressive, experimental, slam and melodic boundaries were explored over the next two decades, Cryptopsy remained brutal and pioneering, expanding what Death metal can be. Having a galvanised stable lineup along with the driving hyper-fast technical drumming of Flo Mounier, 2012’s self-titled album, Cryptopsy, herald a triumphant return to their original ferocious revolutionary sound. The recently unleashed, Book of Suffering: Tome 1, forges onwards cementing their legendary status and current lineup as unmissable. Prepare for Open Faced Surgery New Zealand, this is the Death Metal event of the year. 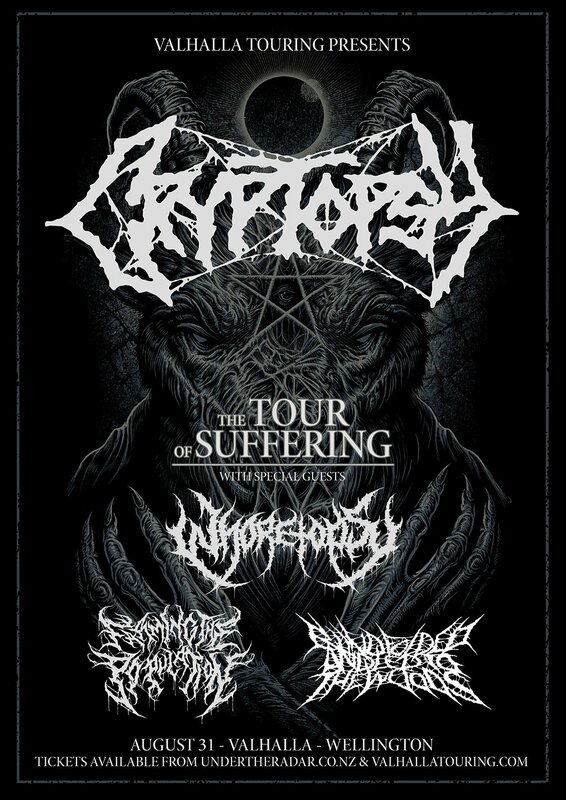 Joining Cryptopsy will be Aussie brutal gore slam merchants Whoretopsy. 2015 saw Blindfolded support death metal legends Suffocation & Decapitated, as well as a string of local shows off the back of their debut album My Vaseline Diaries. 2016 sees Blindfolded re-enter the studio to record their sophomore album which will see fruition of new songs in the vein of their relentless brand of aggressive death metal. This will be Blindfolded’s first Wellington show since their album release in 2014 and will be unleashing an abundance of new material. Technically…death metal. Farming The Population consists of 4 musical anomalies, and 1 bear, executing tight, unpredictable, dissonant Brutal Death Metal. Having only played 1 show since last August If you don’t catch their set the wait is long until the next opportunity. They have a new member, new songs, and are ready to deliver another insanely crushing spectacle. Brutal hails. NZDM.